Given the number of perplexed reviews that accompanied Richard Jones’ production of Kafka’s The Trial, it is a surprise that so many critics avoided the obvious puns the title allows (the honourable exception naturally goes to the Daily Mail). This production certainly reinforces the impression that Richard Jones is a director whose work divides critics between those who feel that his directorial hand does not give the text a chance to breathe, and others who find value in the kitsch lunacy that he establishes through his visual style. It is a style that is so unique as to be instantly recognisable. The importance that visuals play in his work means that credit ought to be shared with his regular collaborators; designer, Miriam Buether, and costumier, Nicky Gillibrand. In both Public Enemy (his reworking of Ibsen’s Enemy of the People) and The Trial, he creates a world that could have come out of a Lynchian vision of a Californian wife-swapping party. The colour palette leans defiantly towards the 1970’s and is almost aggressively lurid. Yet behind the warmth of the orange and peach tones he establishes a clinical coldness that is reminiscent of Kubrick’s best work. The Kubrick reminder can hardly be avoided as Nick Gill’s translation gives Kinnear’s Josef K an internal monologue written in a form of English that is not so different from Alex in A Clockwork Orange. This is the most problematic aspect of a mostly enjoyable production. Having spent a week reflecting, I am no closer to why the decision was made to give Josef K this curious internalised language. 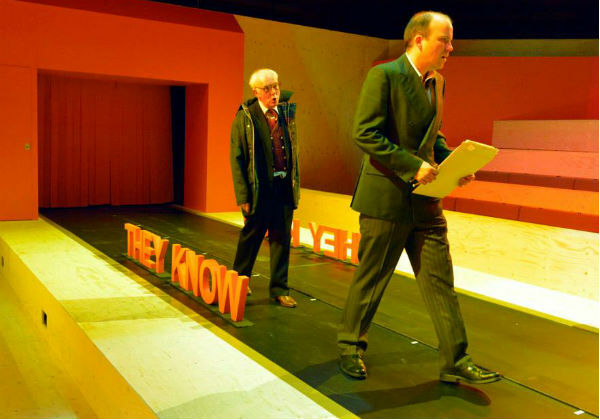 The play appears to suggest The Trial is located in sexual angst (a contentious point in its own right) and Josef K spend much time recounting the historic fantasies that have turned him into the person he has become. It might make sense that the dialogue was babyish, as it would lean towards giving the play a Freudian spin, but instead it is more of a freeform organic narrative that flexes adult English to its own purposes. The style is initially of interest but it never feels essential, and becomes increasingly wearying as the play spirals towards the 2hr mark. 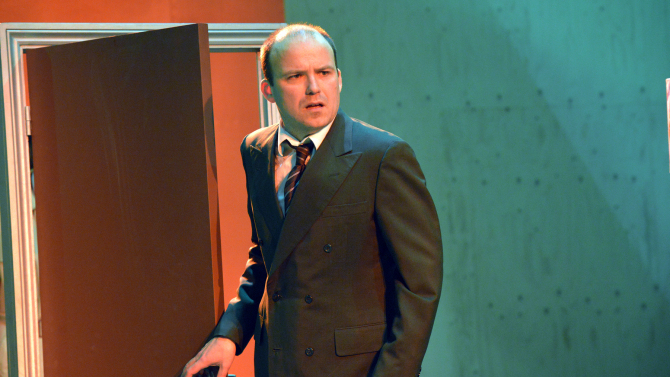 It is also notable that Rory Kinnear, one of the very best stage actors around, doesn’t seem entirely comfortable with it. He has the capacity to speak with such fluency, and so often inhabits the natural rhythms of Shakespeare, that being forced into a choppy, broken structure does not seem to get the best out of him. It is a shame as he is excellent in other aspects of the role. He is a perfect fit for the role of Josef K; an everyman caught up in events that he cannot control. He has no problem in showing us the unravelling of Josef K, taking us from an initial pugnacious contempt for a bureaucratic system that he clearly thinks he is better than through disbelieving bafflement into resigned acceptance. It is difficult to talk about The Trial without mentioning the travellator that runs along the middle of the traverse stage. It may be obvious but it is still a fine metaphor. It hints at the remorseless, unstoppable momentum of the bureaucratic system that Josef must fight against. It is relentlessly moving forwards, and Kinnear’s Josef K must expend all his energy just to stay still. The final acceptance, and the end of his trial, sees the travellator reverse as if to hint that Josef K has eventually accepted conformance. There are plenty of very nice touches in a production that doesn’t feel quite as innovative or as spritely as it ought to be. There is no reason why a play shouldn’t be an exhausting experience, and perhaps this is more appropriate in The Trial than in most, but here it comes from slightly misguided directorial decisions; the interior monologue feels like a misstep and the staging, interesting as it was, ultimately forced the structure into a rather episodic format. However, as this blog has said many times before, it is always preferable to watch an interesting failure than a boring success.